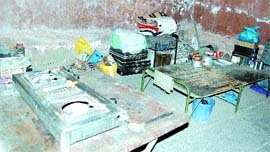 A gas burner and heater damage the walls of the Baradari heritage building at Ram Bagh in Amritsar. Though there has been stringent prohibition act against defacing or damaging the precious historical monuments by the government, yet the act is being ignored, with hardly any guilt, by the authorities. Ram Bagh, an 84-acre summer palace set up by Maharaja Ranjit Singh in 1819, is a prime example to testify the couldn’t care less attitude of the authorities concerned in preserving the rich heritage. The sorry state of saga starts right from the Deori, Ram Bagh, the main entrance to the summer palace complex. The leftover “prized possession”, as major part of the Ram Bagh has been occupied by three socialite clubs, has at present been transformed into residential complex of labour, apparently, engaged to renovate the historical monument. With all their courtesy, the walls of the monument are being damaged because of smoke and oil emanating from the stoves or gas burners, which the labour or the caretakers use to prepare their food. Archaeological experts view that the regular smoke and oil which settle on the “originally built” crust of walls, especially the roofs of the monument, which is made of wood, undoubtedly, destroy them and they cannot be restored. This act should have been stopped immediately. “This heritage, which, for its artistic and architectural importance, has been declared as protected monument of national importance, hardly seem to carry any importance for the local authorities,” said an official of the Archaeological Survey of India, while preferring anonymity. Another pathetic situation is that in the absence of any check, stray animals, which include dogs and other abandoned animals like horses and cows, can be seen anytime in the complex. When The Tribune team visited the area to take stock of the renovation work being undertaken for a museum, it appeared to be a “convenient place” for dogs to breed, for stray horses and cattle to graze. The residents, who used to stroll here in the evenings, said due to laxity on the part of the authorities concerned, the place had also become synonymous with unscrupulous elements. “Every evening or early morning you can find people enjoying “forbidden pleasures” like smoking intoxicants, couples sitting in objectionable manners, etc. This has refrained us from coming here. It is ridiculous?” said Unkar Singh, a resident of city for the past over 55 years. This monument is protected under the Punjab Ancient and Historical Monuments and Archaeological Sites and Remains Act-1964. Any person who destroys, deface or imperils this monument in any manner is liable to punishment with a fine which may extend up to Rs 5,000 or with imprisonment, which may extend to six months or both.